You’ve hardly had a chance to catch your breath from your December credit card bill and now it’s time for Valentine’s Day. 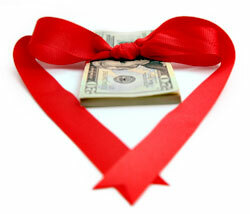 Last year, Americans spent nearly $18 billion on Valentine’s Day — that’s an average of $120 per Cupid’s arrow. But with the economy tanking and job losses hitting an all time low, even lovebirds might not be in the mood to sing. At least not to the tune of $120! The good news is that romance doesn’t have to cost a fortune. It doesn’t even have to cost $120. There are plenty of ways to woo your Valentine while appealing to a pocketbook of any size. Here’s a look at nine of them. 1. Schedule a Spa Date. At Home. Light some candles and fill the tub. It’s spa time — right in the comfort of your own home. You don’t have to spend hundreds of dollars on a fancy day spa to enjoy some well-deserved pampering. While your tub is filling, drop in some essential oils, like lavender (for relaxation) or rosemary (for rejuvenation). Mix up a facial mask for your sweetheart by combining equal parts of olive oil and brown sugar. Throw in a few drops of essential oil and then offer to apply it using gentle massaging motions. Finish up the spa experience with an all hands on deck body massage. Use food grade coconut oil for a truly delectable experience. Or, if your budget will allow, contact your local massage school about a couple massage. What better way to share the love? There is nothing more romantic than laying on a blanket, staring up at the stars with your true love. Of course, in February, the weather is not always conducive to outdoor romps. Where there’s a will, there’s a way: Even the smallest of towns often have planetariums — which make the perfect cold weather alternative for outdoor gazing. Grab a blanket and a pair of double-budded earphones for your iPod, and make a night of it. There’s nothing like a little fresh air to get you feeling frisky. Check out your local trails or set your sites on one of America’s 390-some national parks. The weather is not always reliable in February, but many states are already enjoying springtime breezes come mid February. Even if you have to bundle up for your hike, you will have plenty of fun warming yourselves by the fire when you return. If you want to up the romantic ante, pack a picnic basket (or a backpack, for you off-trail hikers) filled with all of your favorite romantic foods. Go simple with chocolate, strawberries and champagne. Or cook up a fancy feast using one of Holidays on the Net’sgourmet amore recipes. Geocaching is the newest fad, but did you know that following a treasure map can be insanely romantic, too? In this worldwide game of hide-and-seek, a geocacher places a geocache anywhere in the world. He or she pinpoints the exact location using GPS technology and then uploads that information to an online database. Anyone with a GPS unit is welcome to try to hone in on the treasure. You and your sweetheart can get in on the international game — or you can create your own one-on-one version for Valentine’s Day by hiding a romantic treat and sending your partner on a quest to find your love token. Sending flowers is overplayed. Giving heart-shaped boxes of chocolate is pass�. Instead of going with an overplayed — and over-priced — gift option, try to court the element of surprise. Sweet, heartfelt and frugal surprises. Like filling her office with red and white balloons (the kind you blow up and tie yourself — not the costly helium-filled ones). Or packing a picnic lunch with all his favorite snack foods. Or scoring two tickets to that Indy rock concert she has been dying to see. If surprises aren’t your forte, try paying closer attention to the little things. Believe it or not, your sweetie drops lots of little clues all day long about how and when he or she would like to be surprised. In fact, picking up on those clues will probably be the biggest — and sweetest — surprise of all. Or at least 365. Hallmark stores would have us believe that the only time for romance is February 14th. But the truth is that any day can — and should — be inspired by love and courtship. Help spread Cupid’s magic around by making your Valentine a love jar. Fill it with 365 slips of paper that share another reason you love your partner. Or, if putting pen to paper is not your thing, count out 365 candy hearts or Hershey kisses — one for each day that your sweetheart makes your life sweeter! The average dinner for two runs $85 – $250 on Valentine’s Day. But you don’t need to kill your food budget in one night just to have a romantic restaurant experience. Rather than a fancy four-course meal, try skipping straight to dessert. Not sure what to order? Chocolate has long been considered a powerful aphrodisiac. In fact, during Mesoamerican marriage ceremonies, the couple would share a cup of cocoa to increase their luck in love. If hot cocoa isn’t on the menu tonight, why not try the hot chocolate fondue? For two, of course! Americans buy and send 110 million roses for Valentine’s Day every year. The tradition started long ago — in fact, legend has it that the red rose was a favorite of Cupid’s father, Venus (AKA the god of love). Of course, florists are wise to the power of the rose, which is why they raise the price 50% or more on Valentine’s Day. With the average cost of sending a dozen roses on February 14th now hovering around $70, Venus’ favorite is definitely not the most frugal choice. Instead of plucking some blooms, why not try planting them? Take a trip to your local nursery and pick out a flowering perennial together. Then get down and dirty in your backyard planting a living, breathing, growing reminder of your love. Remember back in high school, when you and your beau would make mix tapes for each other? You carefully picked each song for its weighty symbolic value. Thanks to the advent of iTunes, you no longer need a double cassette recorder to create a compilation of love ballads. And, they don’t even need to ballads. (Down with mushy remakes of Mariah Carey — halleluyah!) If you’re stumped for ideas, try visiting artofthemix.org. Upload the mix to his mp3 player and leave a heart-shaped note to enjoy on his morning commute.